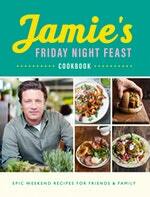 A recipe for the silkiest velvety pasta from Jamie’s Friday Night Feast Cookbook. Made with a simple blend of Tipo 00 flour (00 means it's super-fine) and fine semolina, which has wonderful flavour and a golden colour, as well as free-range egg yolks, this is my ultimate fresh pasta dough recipe. Pile the flour and semolina into a large bowl and make a well in the middle. Separate the eggs and add the yolks to the well (freeze the egg whites for making meringues another day). 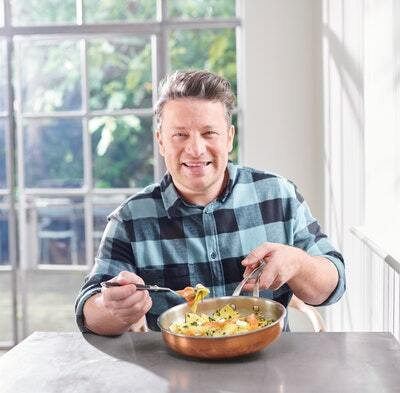 Add the extra virgin olive oil and 4 tablespoons of cold water to the well, use a fork to whip up with the yolks until smooth, then gradually bring the flour in from the outside until it becomes too hard to mix. Get your floured hands in there and bring it together into a ball of dough, then knead on a clean flour-dusted surface for 4 minutes, or until smooth and elastic (eggs can vary in size and flour can vary in humidity: this dough shouldn't be too wet or dry, but tweak with a touch more water or flour if you need to – use your common sense). Wrap in clingfilm and leave to relax for 30 minutes. Divide your pasta dough into 4 pieces, covering everything with a clean damp tea towel as you go to stop it drying out. You can roll it out to your desired thickness with a rolling pin, but I think it's more accurate and fun to use a pasta machine, in which case attach it firmly to a clean table. Start rolling the sheet down through each setting, dusting with flour as you go. Tum the crank with one hand while the other maintains just a little tension to avoid any kinks, folds or ripples. On a clean flour-dusted surface, take it right down to the desired thickness. Generally speaking you want about 2mm for shapes like linguine, tagliatelle and lasagne, then to go as thin as 1 mm for anything turned into a filled pasta, because when it's folded around a filling it will double up to 2mm. And remember, some shapes are easier than others, but with a bit of patience and practice, you'll soon get the hang of it.